If PC will not turn on, you can operate nothing. But even if PC will not turn on, there is not no way. I mean, the situation that PC will not turn on by temporary electrical trouble sometimes occurs. If power will not really turn on, hardware might have some troubles, but they are diffrent meaning "not turn on" = "need to fix". At first, let's observe the PC condition carefully. In case of power indicator light or cooling fan is rotating but PC seems not running, this might not be concerned with power supply. Nevertheless, PC keeps silent when you press the switch, you can still check some things. I will explain step by step for laptop and desktop separately since they have very differ in structure. Laptop has characteristic structure that desktop does not have. By the way the power supply unit of outside means AC adapter. Laptop is easy to carry around, besides AC adapter itself is big and heavy, so end of the cable often get in hard damage. *Especially slim one for PC side. If cable have bend strangely, you should suspicious of it. Even if electric wire is not bared. I also recommend you to check plug side of the power cable and AC adapter are connected firmly. I know the case example that power cable of general-purpose item did not reach to the terminal of AC adapter since it is subtle difference in shape. Some AC adapters show the operating condition by power indicator light. But these days, AC adapter with no power indicator light is increasing because of lower costs I think. You can check the heat by touching in this case. Judgment by using electric tester is best way actually, but people who do not have it much so try to check rough and quickly. AC adapter becomes warm 10 minutes after the cable into power outlet usually. But it warms only faintly because of few power consumption while PC is not turn on. The level of temperature might be slightly warmer than the floor one. It does not rise as much as body temperature, but becomes warm if AC adapter is working. Ultimately, the best way is to confirm the output voltage of PC side terminal by electric tester. If cable of AC adapter side or terminal damaged hardly, or AC adapter is completely cold when connect to power outlet, you would change new AC adapter. Genuine AC adapter is need to order as parts, but can use compatible product by another manufactures for it. But you need special attention to output voltage. Output voltage is written in the label on the AC adapter. The product which is different voltage cannot connect to the PC as different terminal form. Although it can connect, this might cause new problem. 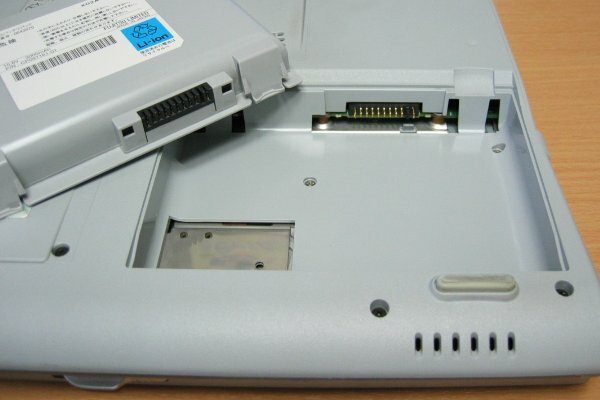 Battery is a characteristic part for laptop and it becomes most cause of power trouble. Remove the AC adapter from PC once, next remove the battery. About how to remove the battery, I want you to read instructions exactly but usually get to know by turning over PC. After remove the battery, connect only AC adapter to PC. Then press power button...it might boot. Sometimes battery causes power trouble by deterioration especially laptop which have been more than 5 years from purchase. When PC can boot in this way, owner rejoice in amazement. In fact, it has not been fundamental solution yet, but they may not matter. In case of desktop, it is simpler than laptop about around the power. Power supply unit and motherboard might become the mainly problem. 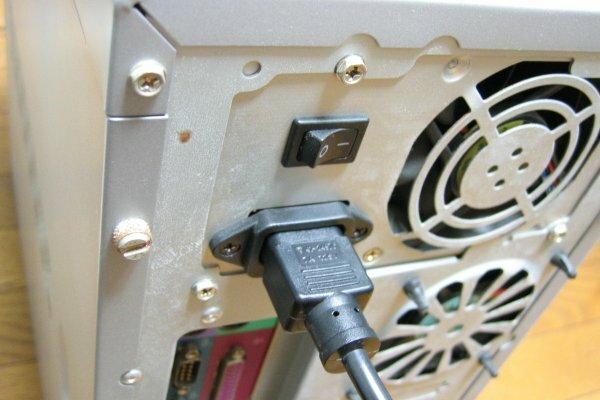 The place which connected with power cable is power supply unit. As home-made PC, power supply unit itself has switch like above image. This switch is zero-one, so in this case the switch is "ON". If it is "0"="OFF", PC will absolutely not turn on. Power supply unit does not have switch itself - for example manufacturer model - is no matter. I try to unplug the power cable once. Not power outlet side, unplug the PC side one. The cable often does not turn on electricity because of power cable is not connect firmly to PC side. Press the power button several times while the power cable does not connect, then reconnect the cable. In other words, discharge the residual electric charge inside once. In case of temporary trouble, it will be able to recover by power resetting. If still cannot get PC booting, you have to check the cause individually. In this case, I'm sorry that I think your PC may in serious condition. Eventually, you might have to change the main parts, motherboard etc.